Mr. Shenkman is the editor of HNN. This article was first published in 2005. Mr. Daniel, the curator in the Division of Work and Industry at the National Museum of American History, Smithsonian Institution, is a leading expert on the flood of 1927. We conducted this interview by email. This past week we have been hearing a lot about the flood of 1927. Just how bad was the flood of 1927? There were 154 Red Cross camps that cared for refugees. All camps were segregated. Many other refugees stayed with friends or relatives. Did the country understand the scope of the disaster? The flood was front-page news throughout the country. The Red Cross made sure that citizens knew of the flood and the need for contributions. What was the reaction of the country? Most people seemed to react with compassion and with contributions. It was a gripping story that stayed in the news as the flood crest moved downriver causing crevasses. At some points the flooded area measured over eighty miles from east to west. Did relief get to the victims quickly? The day after major crevasses in Mississippi and Arkansas President Calvin Coolidge appointed Secretary of Commerce Herbert Hoover to coordinate relief. Hoover presided over eight federal agencies, the Red Cross, the Rockefeller Foundation, and other agencies. The Red Cross was efficient both in rescuing people and in setting up camps. Most camps used Army tents with cots. The food was adequate. For many people the life in camps provided better food, health care, and recreation than they had back home. In 1927 Southern life was segregated, so there were problems along the color line. The NAACP and other black leaders charged that planters were holding their workers in peonage (debt servitude), for the National Guard patrolled the camps and in some cases would not allow workers to leave without permission from the planters from whom they worked. Hoover appointed a "Colored Advisory Commission," headed by Robert R. Moton, the president of Tuskegee Institute, to investigate complaints about peonage and discrimination. Commission members visited many of the camps and found peonage and discrimination in the facilities provided for African Americans. Did federal, state and local officials find it difficult to work together? Did any public figures emerge with shining reputations as a result of their handling of the disaster? Herbert Hoover coordinated all of the agencies involved with little apparent friction. His relief work during and after World War I prepared him for the task. He earned and received praise for his role. James Fieser, head of the Red Cross, also got good press for his work. Congress responded to the flood the following year by creating the 1928 Flood Control Act. Author John Barry says this was the "most expensive bill Congress had ever passed, exceeded only by the cost of the Civil War and World War I." Do you agree with Barry's assessment? John Barry has done research on this topic, and I yield to him. 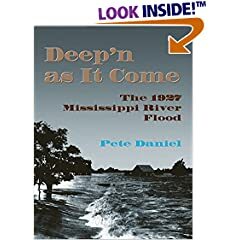 Was the flood of 1927 a turning point in history? Did it mark a decisive change in the federal government's assumption of responsibilities in a disaster? The scope of the disaster suggested that only the federal government through an organizer like Hoover could deal with such a disaster. The "levees only" policy had failed, so the new levee legislation took a more sophisticated view of flood control. For the most part, it has worked as predicted. If the flood of 1927 was a major event why do Americans know so little about it? We have all heard of the Galveston disaster and the San Francisco earthquake, but the flood of '27? People in the South have heard of the 1927 flood. When I did oral interviews in 1976, some people recalled it as if happened the day before. Younger people knew about it from listening to elders' stories. Once the oral tradition vanishes as the older generation dies off, it is up to historians to keep the story alive. John Barry's book certainly helped, as did the "Fatal Flood" video. Perhaps the 1927 Mississippi River Flood needs better public relations. I understand you have just helped create a new exhibit at the Smithsonian about the 1927 flood. Was this planned before Katrina or is the Smithsonian reacting quickly to events? What does the exhibit show visitors? The exhibit that is in the planning stage started after Katrina. Since I had written a book on it and had some objects and photographs, it seemed a good thing to do. There are obvious points of comparison that should interest museum visitors. The exhibit is small, only a case. It will contain a lantern used fighting the high water near Greenville, Mississippi, in 1927, a record by Vernon Dalhart, "The Mississippi Flood," several booklets put out by the Red Cross about the flood, and lots of photographs. The script deals with rescue, relief, , camp life, cultural aspects, and New Orleans. The New Orleans chapter of the Red Cross made elaborate plans, dividing the city into seventeen districts, stocking brick shoolhouses with provisions and boats, and assigning doctors, nurses, and rescue workers. When it seemed certain that the levees would fail, the city fathers arranged for residents in rural Placquemines and St. Bernard parishes to be moved to New Orleans and cared for. The levee was then cut fourteen miles south of the city. Like pulling the plug in a bathtub, the water then drained out of the river across the improvised spillway. New Orleans was saved. How did you come to your interest in the flood of '27? My dissertation on peonage, The Shadow of Slavery: Peonage in the South, 1901-1969 (1972) had a chapter on peonage during the flood. Later I decided to look into the flood in more detail. I hope that these answers give some indication of the importance of the flood. An ugg bailey button better be unborn than untaught,for ignorance is the root of misfortune.Genius17 withoutugg knightsbridge education is like silver in the mine. ugg boots man is not made for defeat. an uggs boots man can be destroyed but not defeated.No rational man can die without ugg lo pro button? uneasy apprehension. Randy Newman (song writer) remembers the 1927 flood. He wrote a song about it. Very moving. Was the 27 flood caused by a hurricane or a very severe storm?